This is the most expensive Supra to ever sell at a public auction. 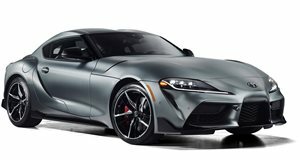 With all the hype surrounding the new 2020 Toyota GR Supra, prices for used examples of the last-generation A80 model have skyrocketed. Earlier in the year, someone paid a whopping $121,000 for a 1994 Toyota Supra with just over 7,000 miles on the clock on Bring A Trailer. If you thought that was insane, another 1994 example recently went under the hammer at RM Sotheby's Amelia Island auction where it sold for a staggering $173,600, making it the most expensive Supra to ever sell at a public auction. Specifically, the 1994 Supra that sold for a record amount is a targa-roof model painted in black with a tan interior. Under the hood is the desirable twin-turbocharged 2ZJ engine mated to a six-speed manual transmission. Depending on the market, the fourth-generation Supra produced up to 321 hp and 315 lb-ft of torque. In the US, range-topping models could hit 62 mph in less than five seconds and do the quarter mile in less than 13 seconds. It's only been driven 11,200 original miles since delivery and looks practically brand new inside and out. Surprisingly, this example fetched an extra $50,000 than the other 1994 Supra that was sold on Bring a Trailer back in January, despite having more miles on the odometer. According to RM Sotheby’s, the car was sold new in Illinois where it stayed for at least two years, racking up almost 6,000 miles. It was later imported to Switzerland roughly 12 months ago before finding its way back to the United States. Finding a low-mileage fourth-generation Supra in condition as immaculate as this isn’t easy, but it’s still a mind-boggling amount of money to pay for a 25-year-old model considering the new 2020 Supra starts at just under $50,000.